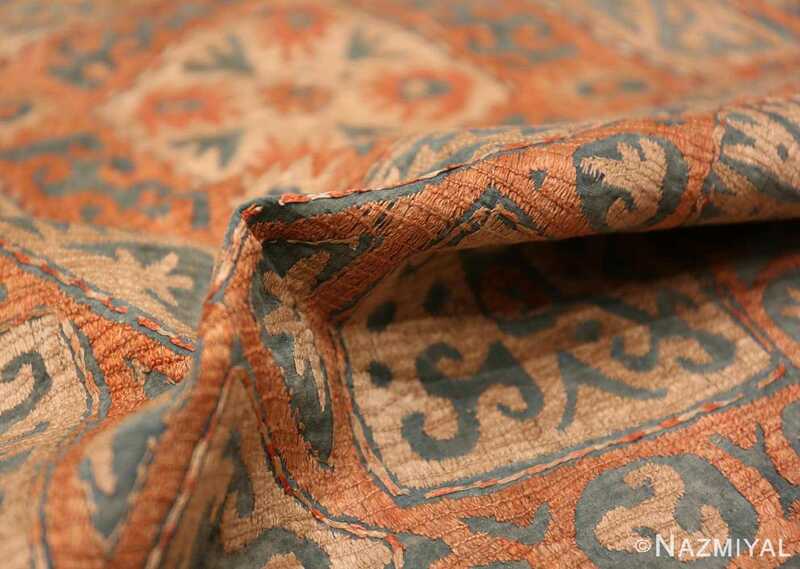 A Beautiful Rare And Collectible Antique Dagestan 18th Century Kaitag Embroidery Textile, Country of Origin / Textile Type: Caucasus, Circa Date: 18th Century – This truly magnificent piece is an 18th century Kaitag embroidery which was woven in the Dagestan region of the Caucasus Mountains. 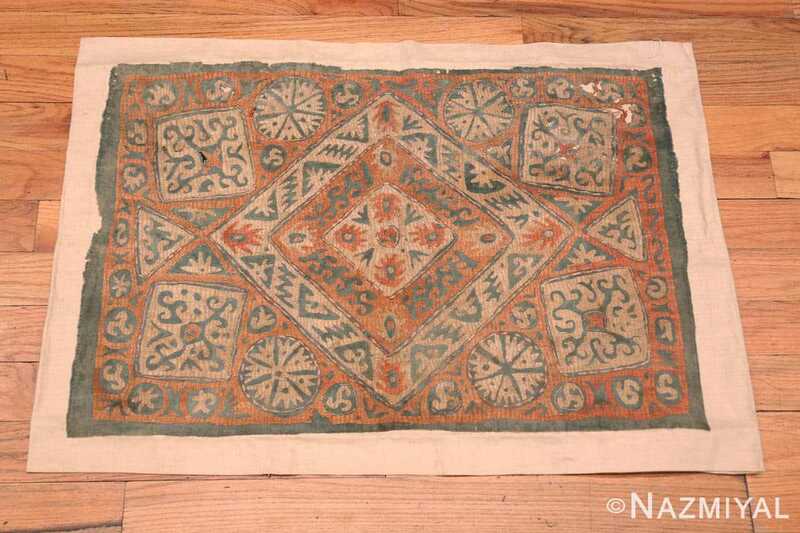 Aside from its beautiful design and use of color, this antique Caucasian piece is a magnificent antique embroidery example. It is an important global treasure, as it represents an art form that is believed to have been formally stamped out by / during the Soviet rule, as with many local, tribal cultures of the era. 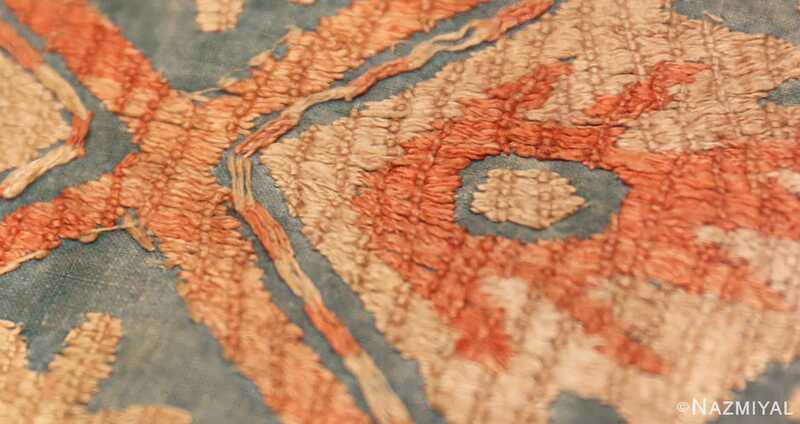 These rare and captivating antique textiles were created by women weavers to commemorate important family events. They were passed down through the generations, some as dowry gifts and familial heirloom pieces. Others were actually woven with many lucky charm designs, to be used as covers for the baby’s cradle. These were mostly meant to keep the baby safe from any evil spirit. Sadly, only a limited number of these magnificent pieces of history survive today. The design uses primitive symbols that are found throughout the world. 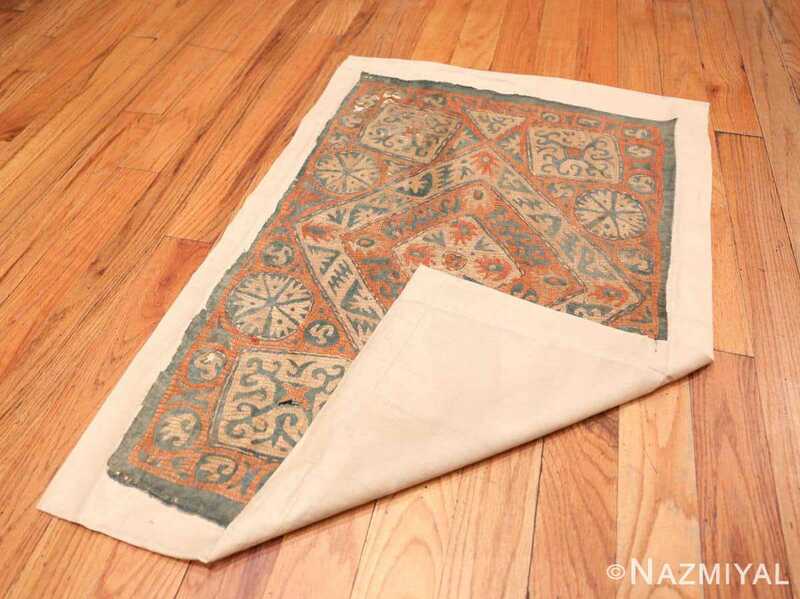 Many of these design patterns were heavily influenced by Byzantine culture, designs of Persian rugs and Islamic art. However, each of the designs shows the personal tastes and preferences of the individual artist who created it. 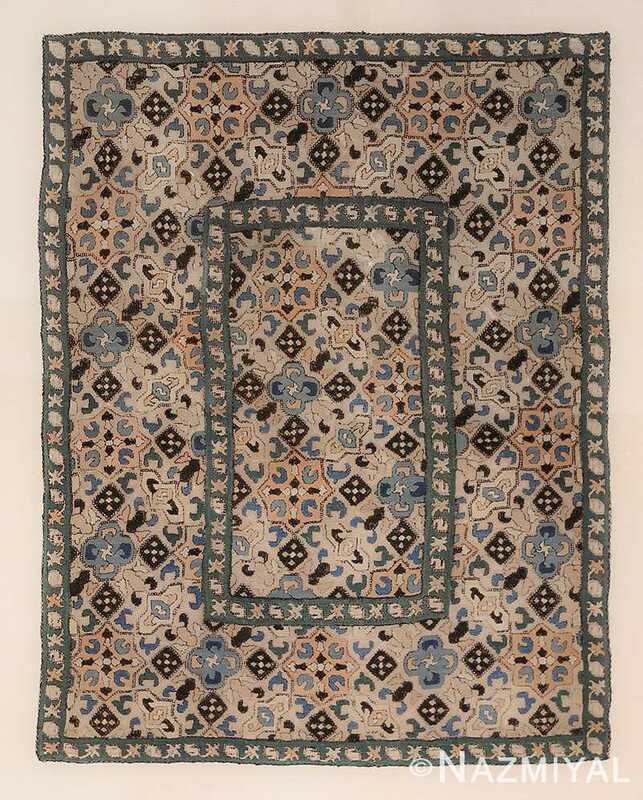 The design of this rug is similar to Persian art in that it uses a central medallion, pendants, formal corners, and a border to frame the design. The basic structure of a traditional Persian rug can be seen, but the individual motifs have a uniquely tribal quality. 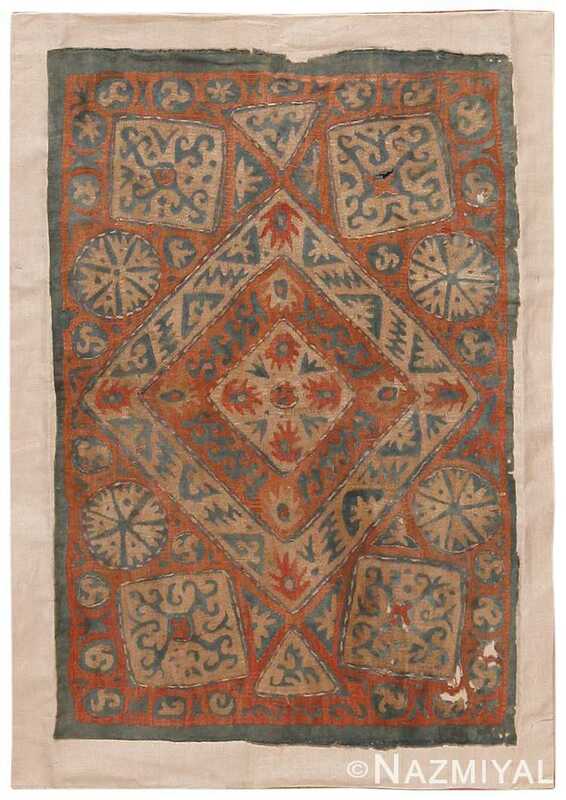 This is a rare antique Dagestan 18th Century Kaitag embroidery textile that was made for a special occasion and represents a culture and time before the modern world took over. 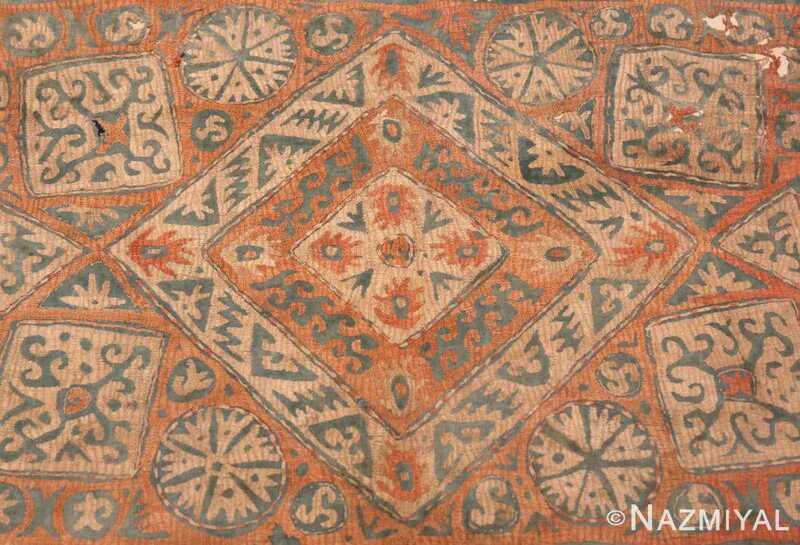 This gorgeous 18th Century Kaitag embroidery would make an excellent addition to any antiquities collection.